A half mile-wide monster tornado with 200mph winds that hits many homes, businesses and two schools. Oklahoma authorities expected the death toll to rise, according to the report by Fox News site. Oklahoma Medical Examiner's Office spokeswoman Amy Elliott said, "the death toll is expected to rise. Oklahoma City Police say seven of those deaths were children at Plaza Towers Elementary School, which was hit by the tornado." Oklahoma Police said that Tornado killed at least 51 people, there are also 4 people were killed at a 7-11 convenience store. The two schools are Briarwood Elementary School in Moore and the Plaza Towers Elementary School. According to the National Weather Service, tornado travel on the ground for nearly 40 minutes, going to 20-mile path through Newcastle, Moore and South Oklahoma City. 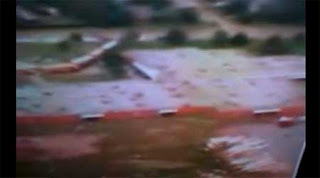 Watch below the actual footage of the Elementary School hit by tornado in Moore Oklahoma. For the meantime, If you feel that this details are informative, please bookmark it now or visit this site more often for you to be updated. You may also share this post to your friends so they may know about Oklahoma Monster Tornado that hits two elementary schools. Comments or suggestions about "Oklahoma Tornado hits 2 elementary schools (Video)" is important to us, you may share it by using the comment box below.